Model 9400 is available in 8', 9', 16', 18' wide by 7' and 8' high. Wayne Dalton maintenance-free factory finishes look great on any home. The 9400 model doors are available in white, and are beautiful as is or ready for you to custom paint to match your home's color scheme. You may also special order the doors with stain. 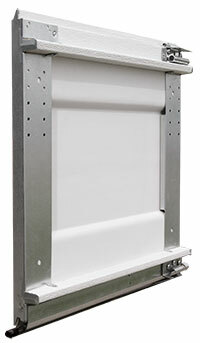 Wayne-Dalton developed the first integrated pinch-resistant door design in the industry. All Model 9400 doors come with foamed-in-place polyurethane insulation that has an R-Value of 10*, giving excellent insulating ability to control energy costs. A bottom weather seal blocks drafts and helps save energy. Wayne-Dalton warrants your model 9400 Door for as long as you own it against cracking or splitting due to rust-through and against degradation of the foam insulation. Your track is warranted against defects in workmanship or materials.